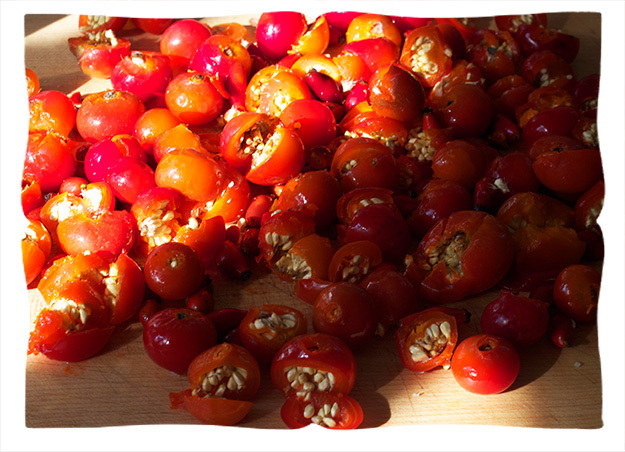 Last year we made a rosehip infusion, sweetened lightly with a little stevia, and used within a short time like you would fresh juice. 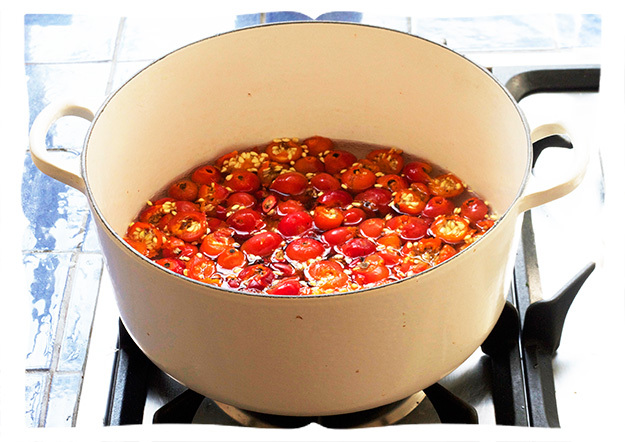 This year we wanted to preserve rosehip cordial to use medicinally throughout the winter. 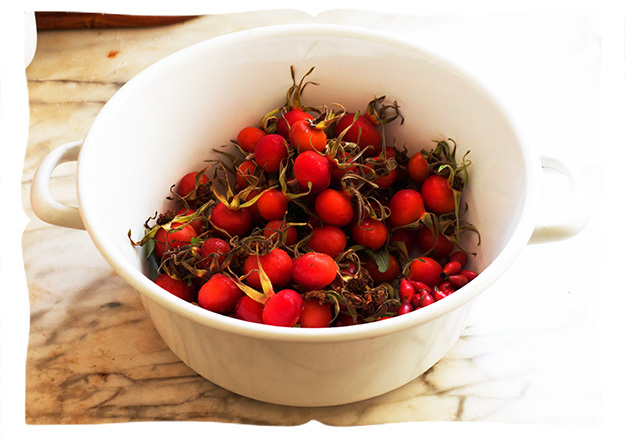 Gathering rosehips to make a vitamin C-rich cordial was encouraged during wartime in Britain. We’re growing very fond of the tradition. We used a combination of rosehips, including apple roses like the ones Alÿs Fowler showed us. We’re so fond of nibbling round those fresh, but they were starting to go, so we hurried to collect a bowl of them. Then remove the stems. Aren’t they just gorgeous? Chop them roughly. Keep in mind that the seeds are used for itching powder! You needn’t remove them though. 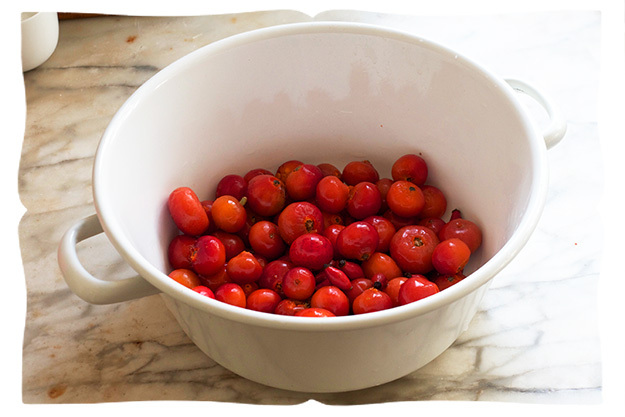 Toss them in a pot of boiling water using just less than double the volume of water as their weight – so if you have 400 grams of rosehips, use about 700ml of water. Bring it all to boil again, leave it to cool somewhat, and pour through a scalded cloth. 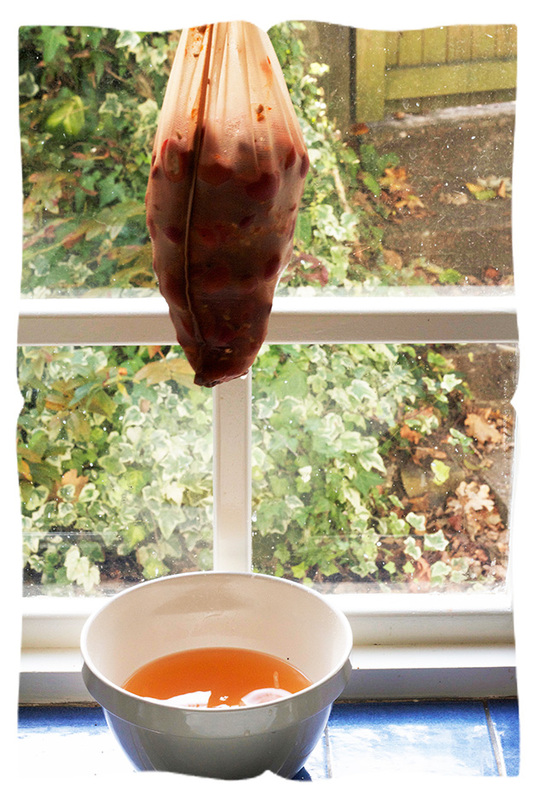 Hang up your muslin or jelly bag full of rosehips and let them drip for a while, and repeat the whole process again. This time leave it to hang overnight. Combine the infusions and measure them. 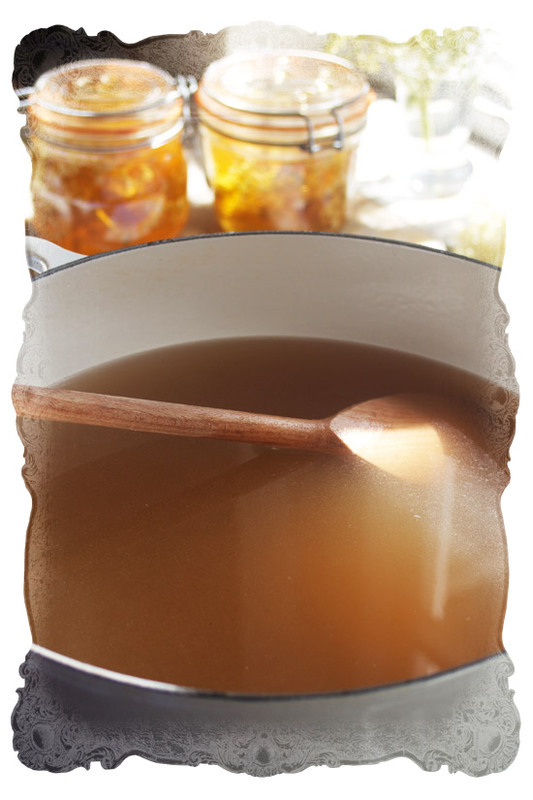 The River Cottage Preserves recipe calls for 650 grams of sugar to about 1 litre of juice. 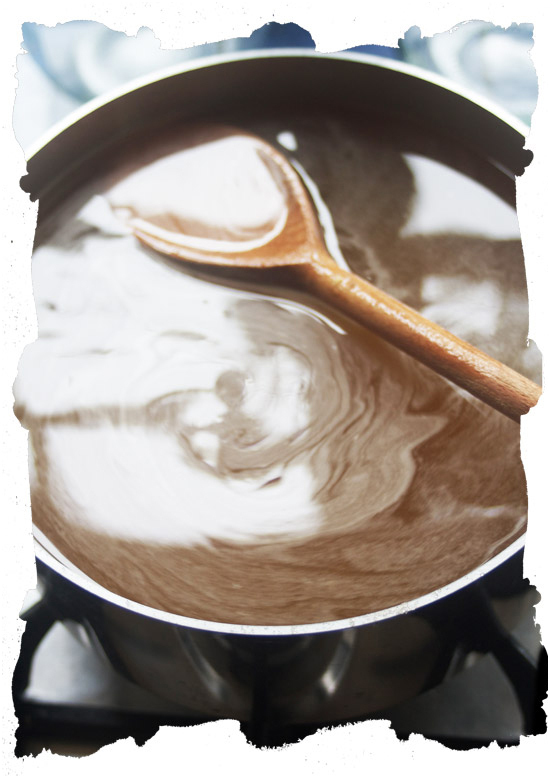 Slowly heat til the sugar is dissolved, then boil for a couple of minutes. 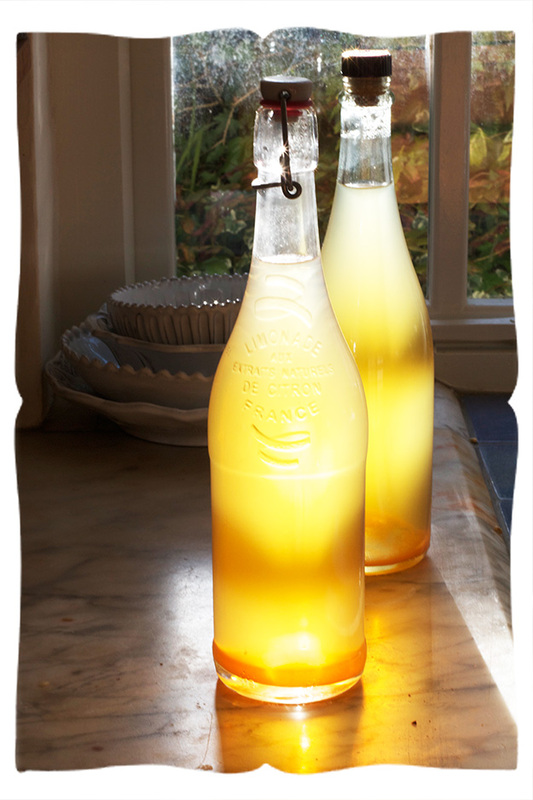 I sterilise my cordial bottles in the dishwasher and if I can’t time it well to have warm bottles ready, I fill them with hot water while they’re waiting, then quickly pour the water out just before ladling in the hot syrup and corking them. Preserves says to use within 4 months. This won’t be a problem over here. 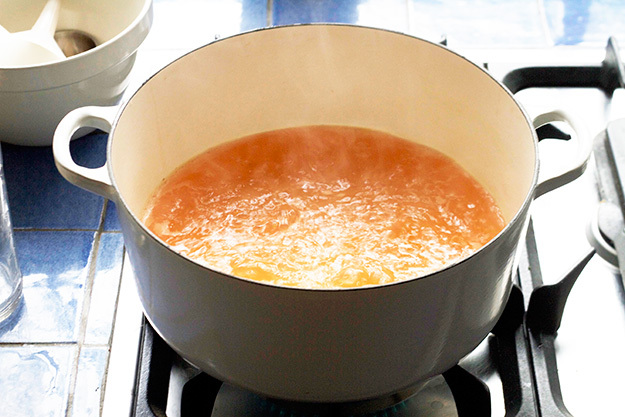 Sterilise in a water bath if you want to keep it longer, and keep refrigerated once opened. We love a couple of splashes of rosehip cordial in a glass of water and we’re very much looking forward to having it all through the cold seasons. 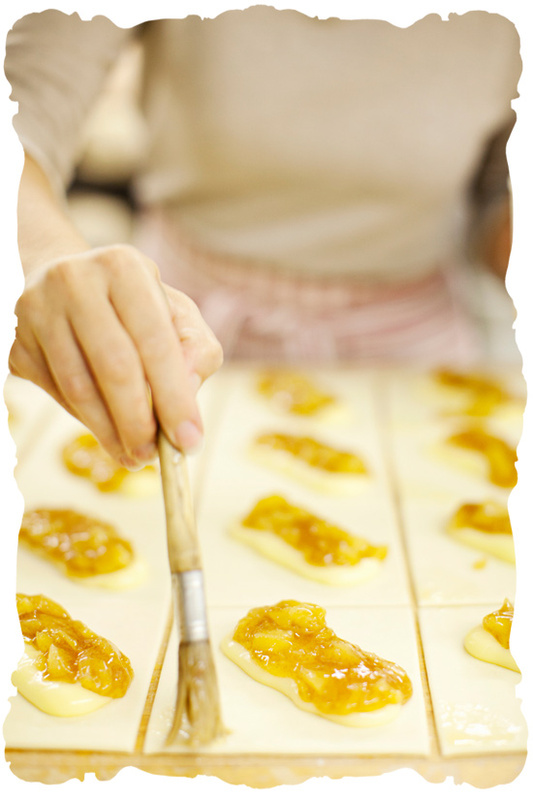 To celebrate a year of homemade stories, I bring you appleturnover‘s original homemade story. A dozen years ago, when I was pregnant with our first child, I made up a little song to hum to my sweetheart when I very much wanted him to visit Fratelli Bakery and bring me one of their glorious apple turnovers. It is a small but effective song. I may hum it for you sometime. When we collected the family together to tell them we were having a baby, we brought a box of those apple turnovers to have with tea. When I began to think about writing homemade stories, our little child would sing my appleturnover song and it seemed to fit my project ever so well. So appleturnover began. 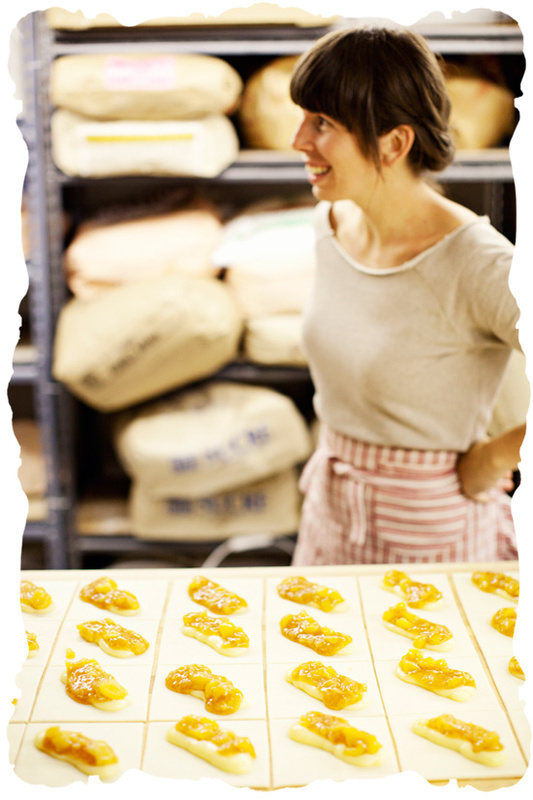 I was beside myself with joy when Fratelli‘s delightful owner, Marco Cornale, welcomed me into his family bakery this summer to teach me how to make the apple turnovers I’d fallen in love with. Beside myself! Dancing! Singing! I brought along my friend, the talented photographer Janis Nicolay, who shares a passion for baking. We were both in heaven. We made two kinds of turnovers. 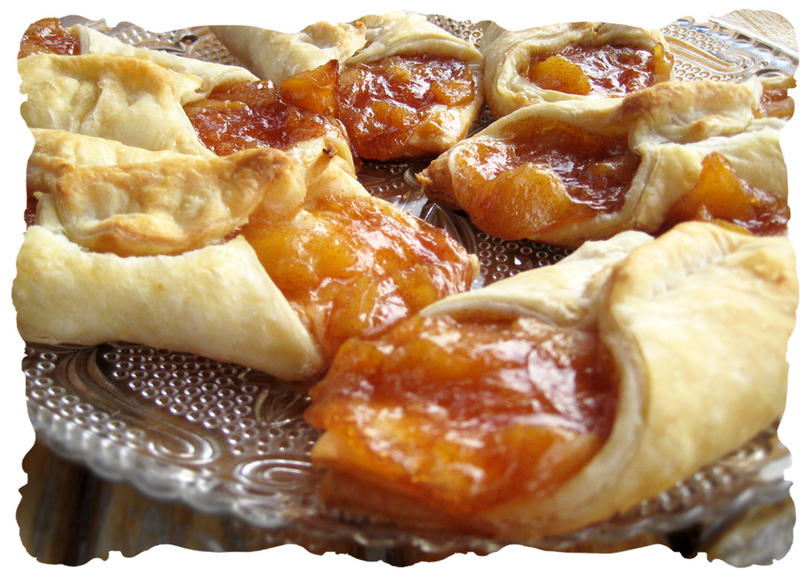 Yes, these are cherry turnovers, however they are gorgeous, and will demonstrate the traditional turnover. 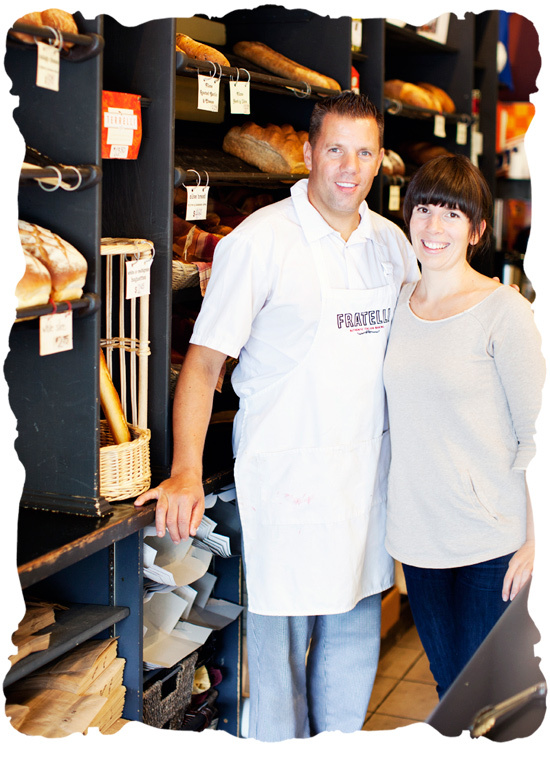 Fratelli makes so many turnovers, they had someone build a pastry cutter in the perfect shape, but you could achieve the same effect by pressing a large, clean tin can. Marco showed me how to paint a half-circle of beaten egg along the edge of the turnovers. 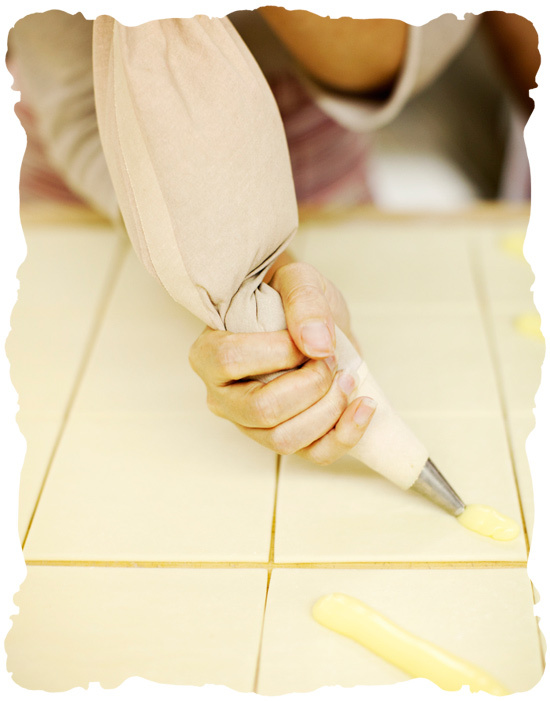 Then we folded the pastry over to meet the opposite edge, tucking up the filling. Press with a couple of fingertips starting at the middle and working each hand out toward the fold, the index finger pressing firmly into the spot the middle finger was last in, then work back down to the center again. That’s good. 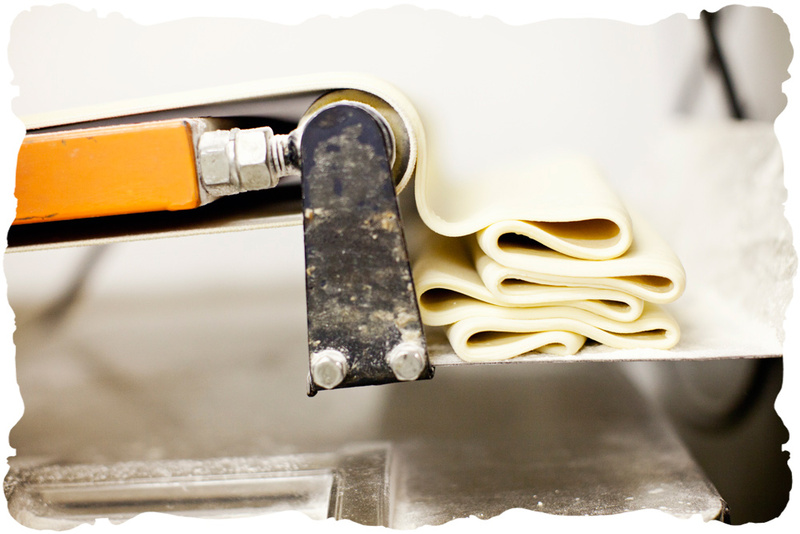 Make a vent, as you would for a pie, with a couple of snips, to allow the heat to escape without blowing up your turnover. That would be tragic. Next we made the apple cream turnover, a slightly different style, the one I fell for. 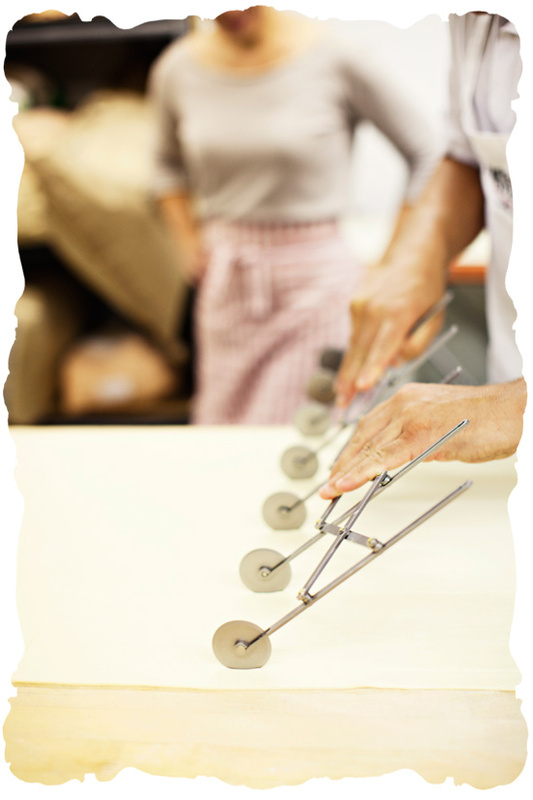 I’ll be rolling out my pastry with my best pin at home, as the family used to at Fratelli. 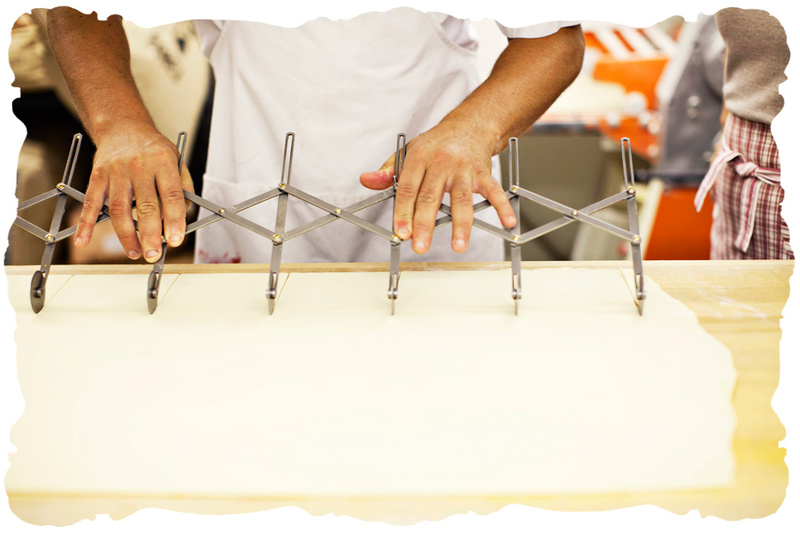 Now they use a wonderful, simple hand-operated machine that rolls their dough out perfectly, back and forth til it’s the right thickness. And rolls it onto a baton, amazing. 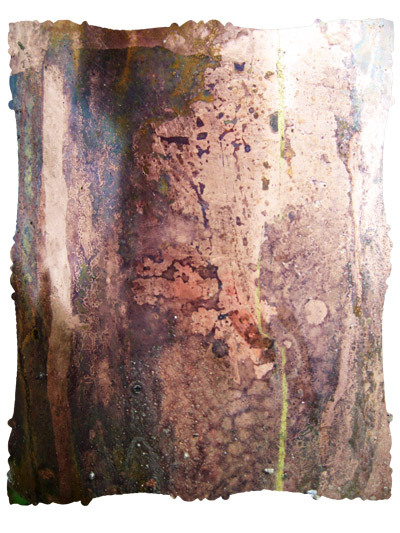 Then she simply lifts it onto their beautiful work table and unrolls it like a scroll. Then sliced again at a right angle. I’ve been eyeing my pizza cutter to see if it will be up for the job. 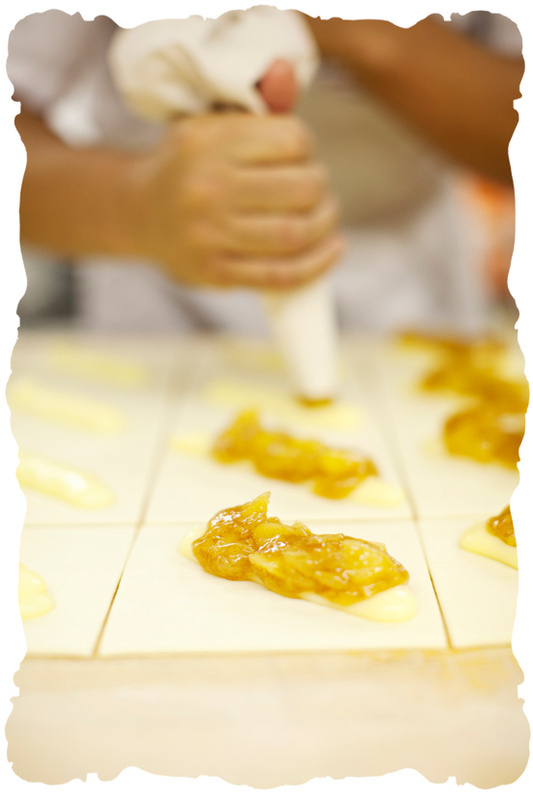 On top of the custard, add a stripe of the apple filling. Oh yes. So wonderful, a dream, to see how these are made. The bakers are so much fun. Find the egg and brush again, but this time just paint a bit across a corner. 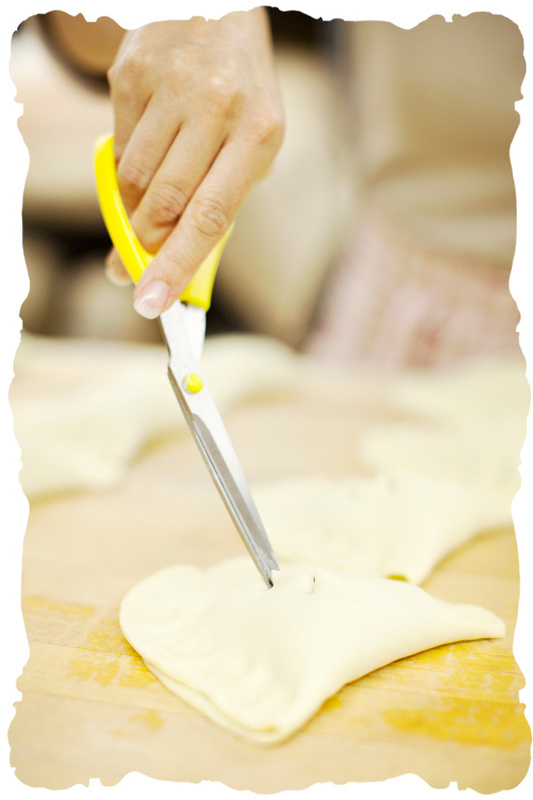 Fold a bit of one corner over the other, and give it a great firm pinch. That’s right. 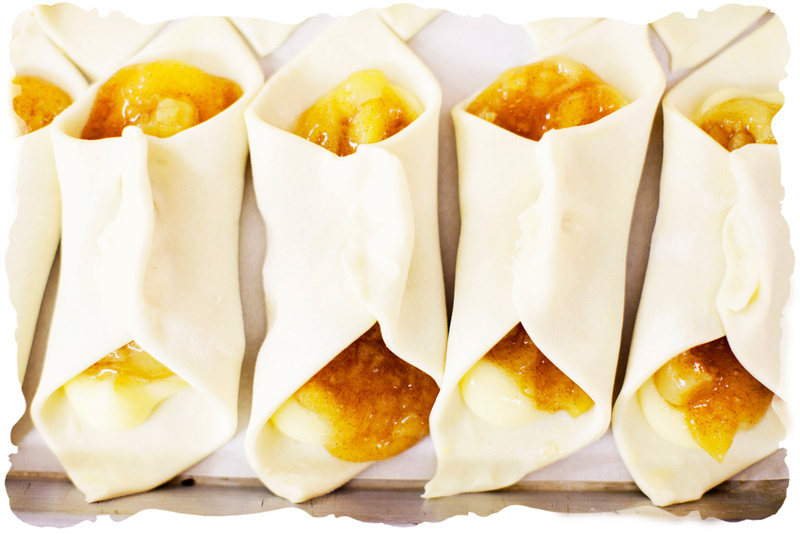 There they are, apple cream turnovers all in a row, ready to bake, magnificent. The pastry chef was so sweet to us. 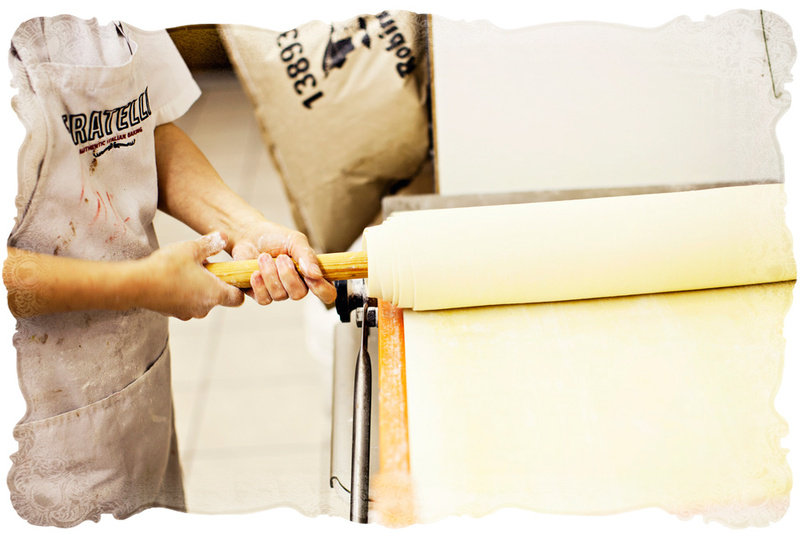 It’s absolutely enchanting to be in that bakery. Marco’s wonderful mother and one of his daughters were there helping out, everyone is ever so friendly and received us with astonishing warmth. 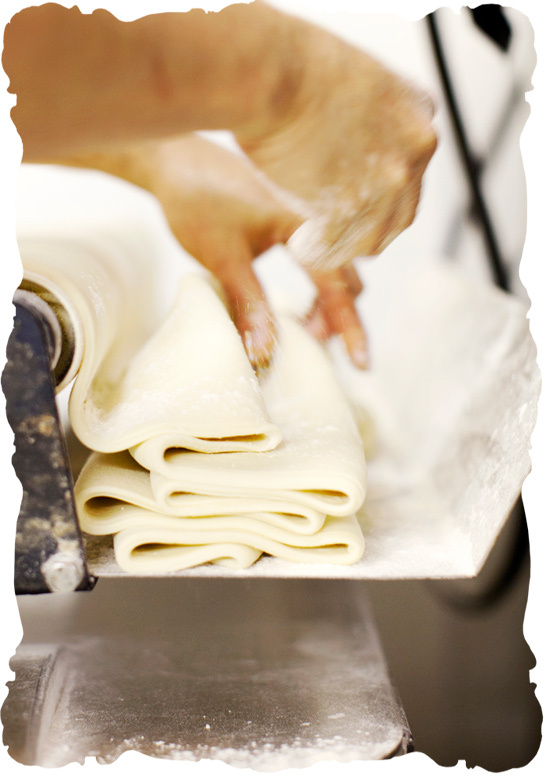 Marco sent us home with turnovers to bake fresh for our families. Rapture! Then my little girls did a happy dance of their own! early in the day for an apple turnover. If you’re not, you can bake them yourself! Send me a note and I’ll send you the recipe! Thank you to Marco and everyone at Fratelli, for such an experience, and to Janis, for the beautiful photographs. You can follow her over at Pinecone Camp. Thanks ever so much to my sweetheart and our family for such devoted support this year, all my love and gratitude. 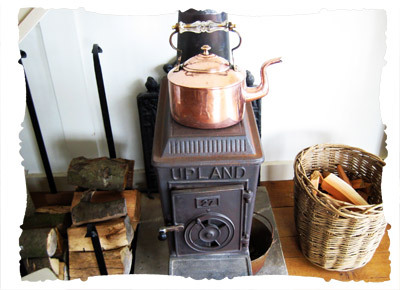 I’m so looking forward to learning more about traditional skills in the kitchen garden, good old fashioned handcrafted ways of making things, and tried & true objects. 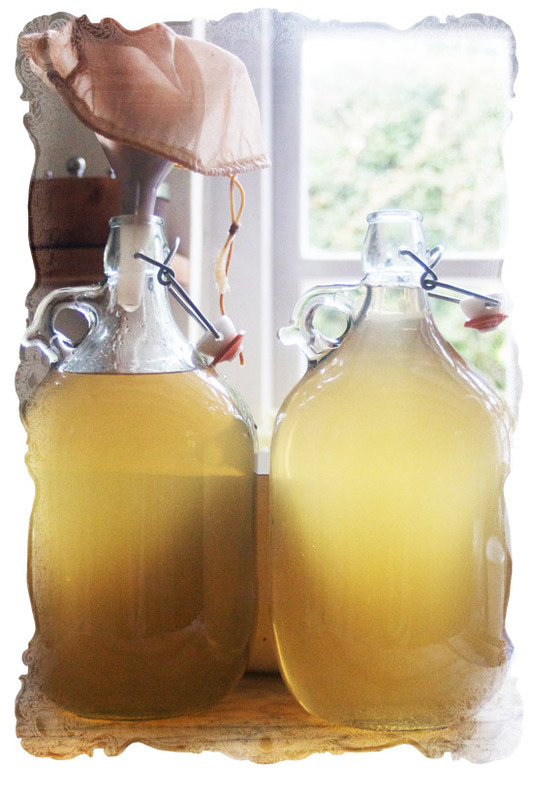 We all went quite mad for elderflower cordial after our first time making it, putting it in jellies, cocktails, popsicles, so I was relieved to have time to put up a few bottles this year. I hope we can console ourselves with elderberry preserves later on, when the flower cordial has disappeared. 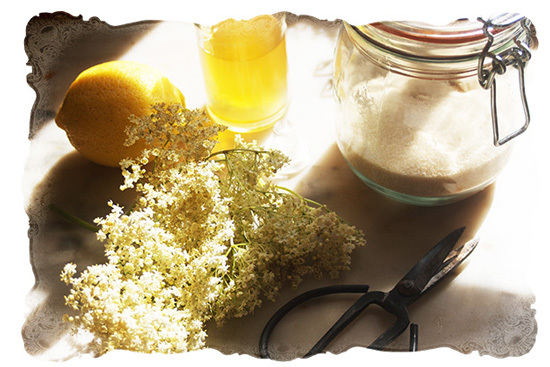 I’m delighted to bring you the great elderflower cordial recipe I use, courtesy of the good folks at River Cottage, from their essential Preserves handbook, number two in the series that I find so gloriously inspiring. 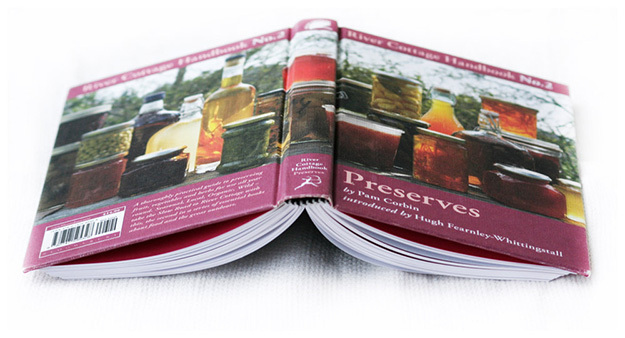 Preserves makes a particularly nice companion to Hedgerow, for putting up wild edibles. 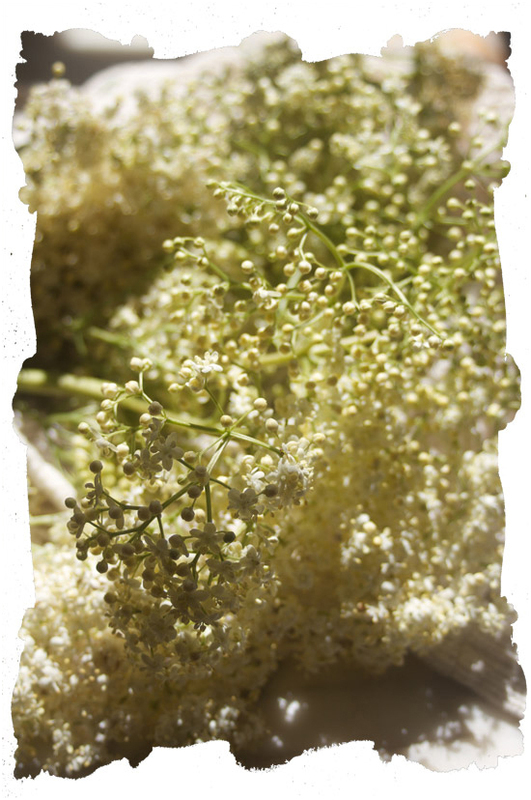 Inspect the elderflower heads carefully and remove any insects. 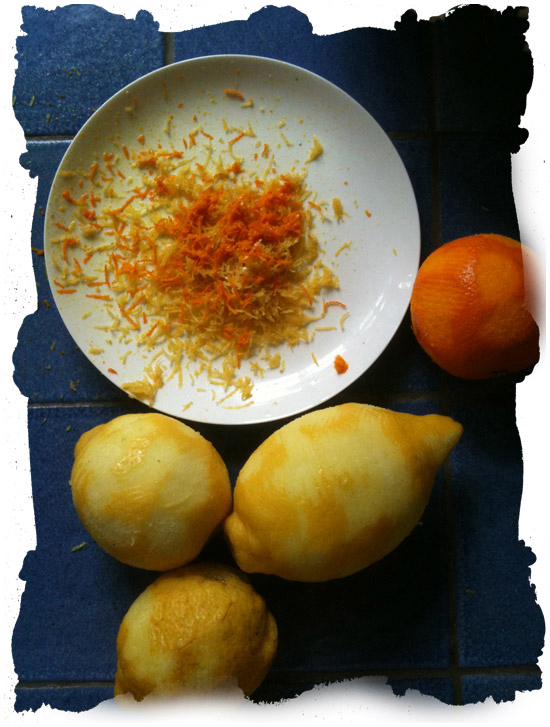 Place the flower heads in a large bowl together with the orange and lemon zest. 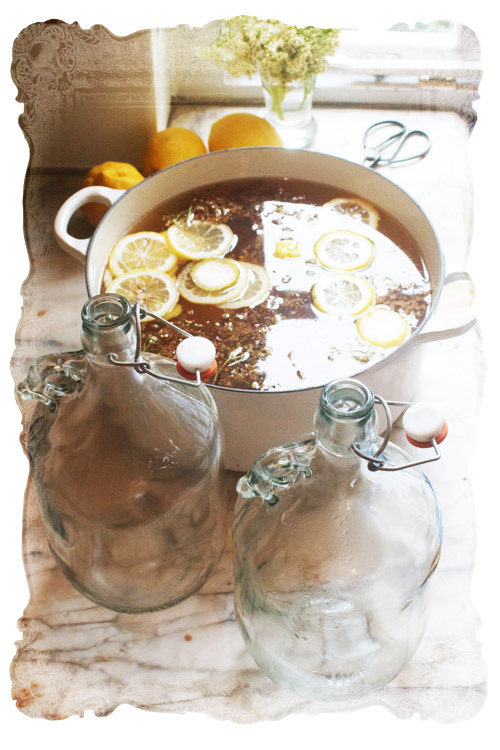 Bring 1.5 litres water to the boil and pour over the elderflowers and citrus zest. Cover and leave overnight to infuse. The colour is quite something. Heady scents. I measured out the sugar on my trusty scales. 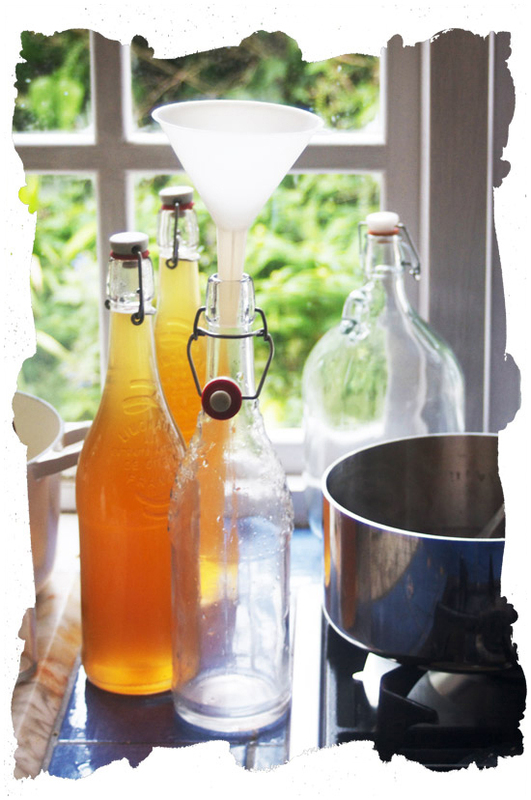 Ours will keep for about four months, as we sterilised the bottles first and poured the hot syrup in, and sealed, while the bottles were still hot. A water bath process would allow storage up to a year. Of course, it’ll be gone in a wink. Pam Corbin suggests having it with champagne, or over fruit salad. A couple of days ago we spotted a recipe for an elderflower and gin cocktail. Heaven. I’ve brought the handbook with me to Canada in hopes of preserving a few other things. Exhilarating prospect. Thanks again, River Cottage! 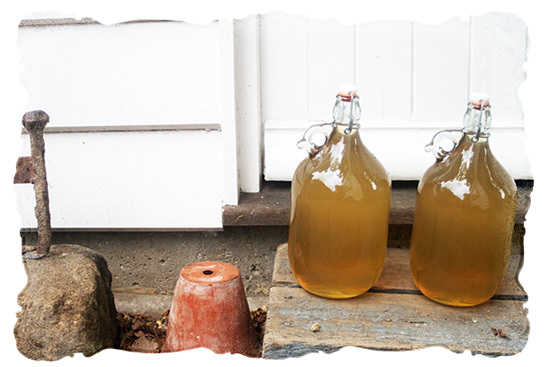 We’ve bottled up our annual elderflower brew. It’s remarkable how much easier it is when you’ve tried it even once before. While the girls were out gathering flowers, I got started. 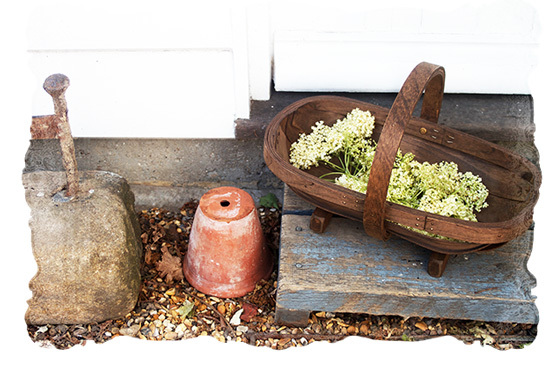 Elderflowers won’t keep! I followed a slightly different recipe that I discovered last year after some anxious research. 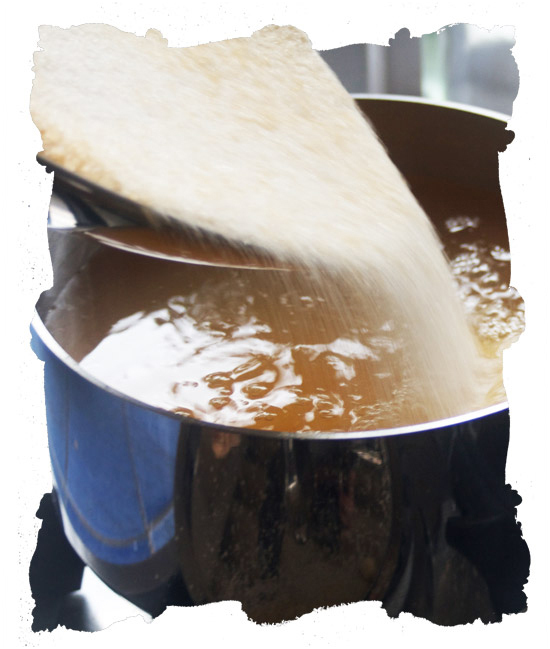 Dissolve about a kilo and a half of sugar in eight pints of water, and let it cool. 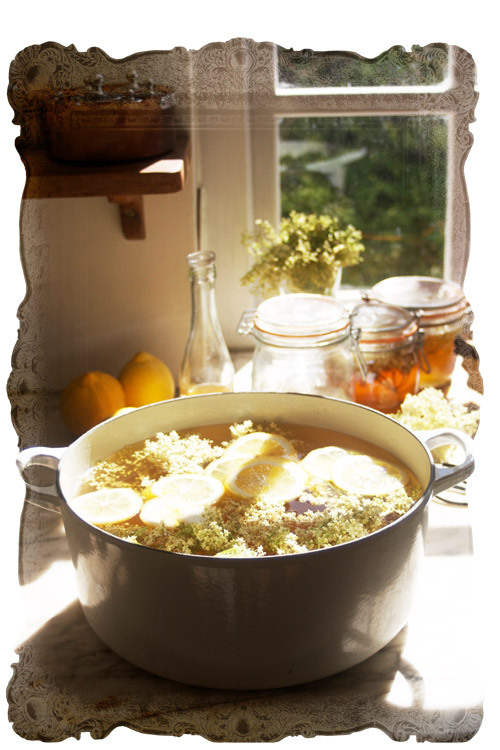 Slice a couple of lemons, choose seven or eight of your freshest elderflowers and clear off any insects (have a good shake outside! 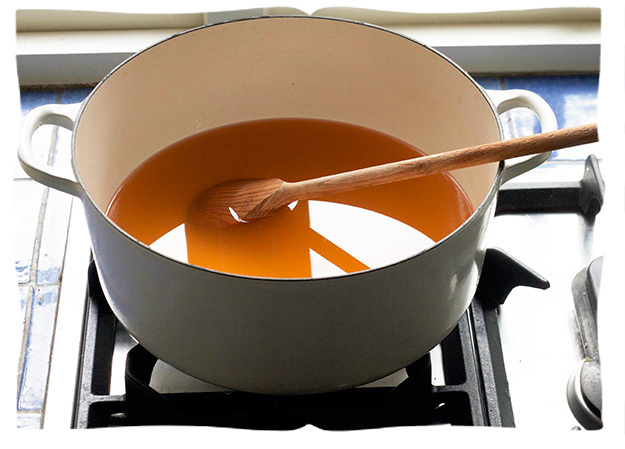 ), measure a couple of tablespoons of white wine vinegar, and throw it all in the cooled sugar solution. I covered the brew with a few layers of cheesecloth, and left it for 24 hours. Some folks say to keep it longer, til it bubbles, and others say it won’t bubble til it is bottled. Oh dear. We’re trying the 24 hour version. It does smell gorgeous, there should be a perfume. I sterilised my bottles in the dishwasher. You want very strong flip-top bottles intended for bottling under pressure, or you may have an explosion! After scalding a ladle, funnel, and mesh bag, I filled the bottles. p>They are a pleasure to look at, aren’t they? I’ve stored them on a shelf with another strong shelf above, so if I do get an explosion, it will be contained. I know, how terrifying! Truly these bottles are made to hold tremendous pressure – not all flip-tops are. This elderflower champagne should be ready in a couple of weeks, but I’ll uncork it for my reunion with my sweetheart, on our return to the old country cottage. 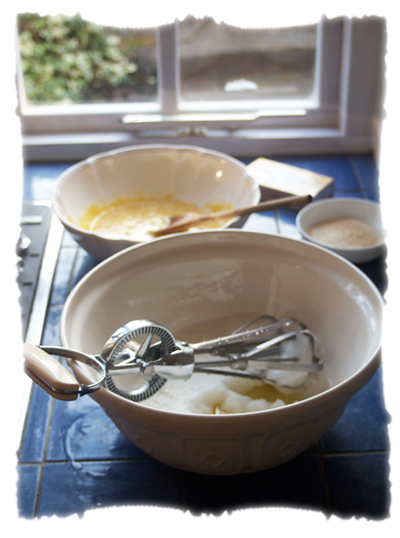 Of late I have been compelled to admit that a good mixing bowl is essential for making cakes. I’ve tried mixing in bowls that bounce and slide, that hold only half of the ingredients, that leave me to spill batter between a pot and a pie plate. Disaster. Yet I am determined to learn to bake an excellent cake. When my copy of Cakes, the newest River Cottage Handbook arrived, my sweetheart went to look for the remedy. 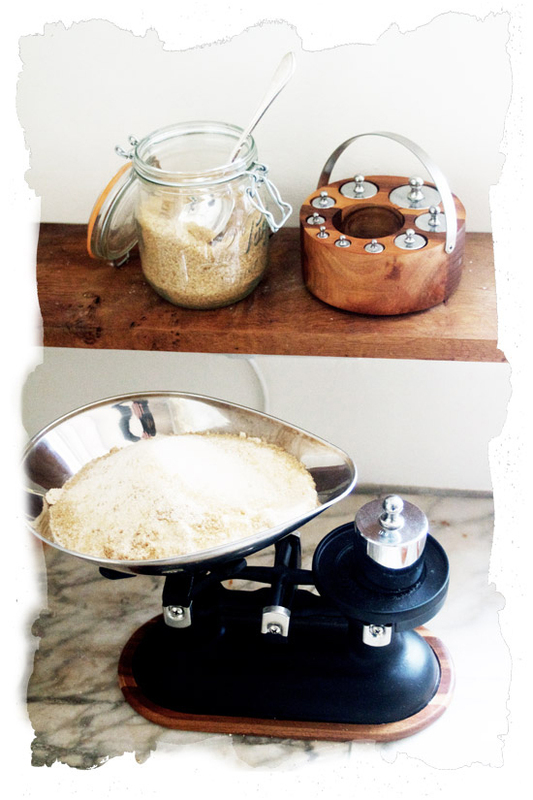 Like my traditional scales, the Mason Cash mixing bowl is a classic. It is grounded by its solid weight, so my two small bakers can beat a rhythm round it with wooden spoons without knocking it to the floor. The depth of it contains clouds of flour and effortlessly fits a couple of cakes worth of batter. 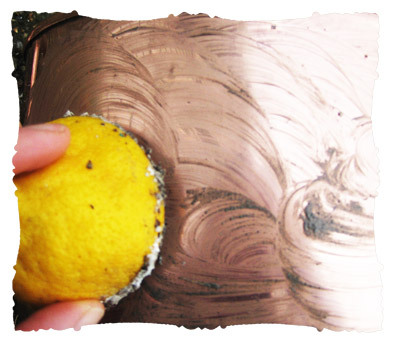 Textured designs along its outer surface act as grips when mixing or washing it. Looking timelessly elegant is pretty great too. 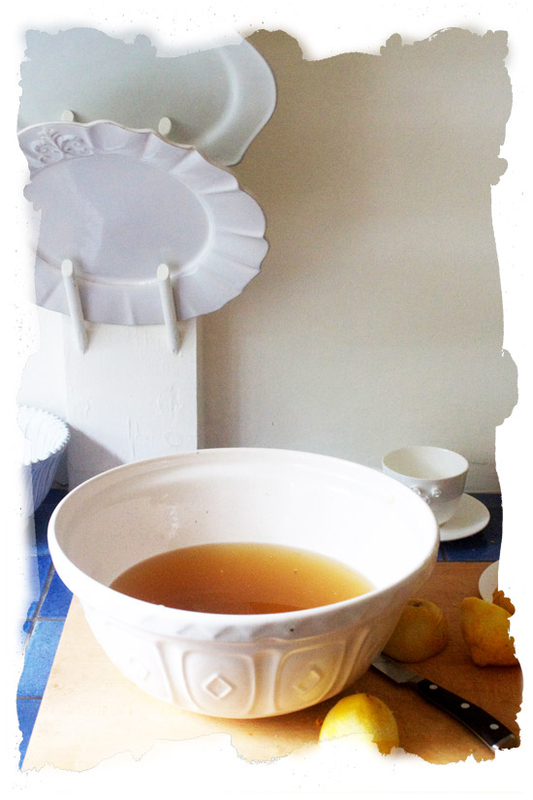 The bowl will function beautifully for culturing a sourdough sponge, cream cheese and yogurt. And most especially for cakes. I’m a proud owner. 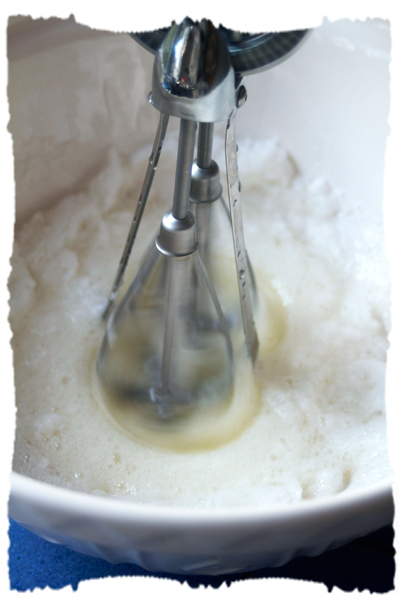 For thrashing egg whites into airy peaks for a flourless chocolate torte using my trusty whisk, it’s ideal. Torte-recipe forthcoming, one to persuade you that every cake should contain at least two bars of chocolate. Happy Springtime!